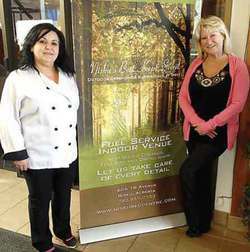 Head Chef Anna Diogo (on left) and General Manager Sherrill Campbell (on right) are justifiably proud proponents of the Nisku Recreation Centre. If I told you there was a little known spot nestled in the trees with wildlife strolling by the huge picture windows, a lovely patio and covered picnic area available for dining outside during the summer months and home made food served up daily at bargain prices I'm betting the average person would be willing to hop in their vehicles and drive for a little while to treat themselves to the experience. What if I told you this place was mere minutes away from Leduc City proper? What if I told you this little idyll could be found right smack in the middle of Nisku? I know, you'd probably tell me I'm off my rocker to describe a quiet forested haven in the middle of North America's largest industrial park but I promise you, it really is there. The Nisku Rec Centre, affectionately known by its small but loyal clientele as the NRC, stands in the middle of 12 acres of forested loveliness, which, for trivia buffs, is actually the second largest freestanding tree site in any North American industrial park. Year round you can sit inside and watch the resident momma whitetail deer (with two fawns in tow this year!) stroll past the eight foot tall picture windows that line the back wall of the dining area, or if you are lucky you might catch a glimpse of the Great Horned Owl that calls this glade home. During the summer months there are birds and squirrels galore to watch as you sup on the large back patio, dine under the covered picnic area or take a stroll through the groomed forested walking trails on the property. For those looking to release a little stress over the lunch hour, or at any other time for that matter, the NRC also boasts a fully equipped gym tucked under its roof with shower/locker rooms, two racquetball/multi-use courts, a main floor weight room and upstairs cardio room that both take advantage of the great outdoor views, and 24 hour key fob access for members. However, if you ask any one of the regular clientele at the NRC why they keep coming back almost every single one will say that two things keep them returning on a regular basis: the food and the staff. All of the food at the NRC is home made on site and I mean ALL of the food, right down to their bread. Head Chef Anna Diogo has been with the NRC for over seven years and her talent in the kitchen has helped put the NRC on the map as one of the tastiest places to nosh in the region. The kitchen is open from 7 am until 1:30 pm Monday to Friday with a lunch buffet that starts at 11:30 and changes daily. There is always a scratch made soup with Anna's home made bread to start, then all of the freshly made salad choices and four or five hot selections that can range from a full on Ukrainian smorgasbord (on Thursdays), to hearty stick-to-your-rib sliced roast beef and pork chops with all the fixings, cheesy pasta dishes, and a meatloaf that you'll never tell your mother about because it is so much better than hers! And we haven't even touched on the desserts that accompany every lunch buffet. Two tables are laden with tempting treats to top off your luncheon experience at the NRC with lovingly made pies, cakes, cookies, bars and puddings that change up daily according to the whim of Anna and the kitchen staff. There is a small selection of items to be enjoyed from the regular menu as well and you will certainly not be disappointed if you decide to go with a burger (which is highly recommended!) or a clubhouse sandwich (which is made using their home made bread and I dare you to finish at one sitting!). And where else can you get a two egg breakfast with sausage or bacon and toast for $2.95? But again, along with the food, it is definitely the fun atmosphere that the staff create that keeps the regulars coming back, often on a daily basis. If you decide to enjoy a breakfast or lunch at the NRC chances are you will not escape the attentions of Anna or General Manager Sherrill Campbell for long. Always circulating throughout the room during meal times these two lovely ladies are sure to introduce themselves to any new faces in the room and within moments newcomers will be welcomed, joked with, and teased within an inch of their lives until they feel like family before lunch is over. Running with a small staff of eight, Sherrill has seen significant changes in the facility over the eight years she has worked there. Originally the NRC was run by an independent board but a couple of years ago the County of Leduc took over the facility. "It has been great to work with, and for, the County these last couple of years," stated Sherrill, "because they have given us a lot of support and the ability to upgrade the facility but also the freedom to run it as we know how to do. The NRC is self sustaining but it's good to have that kind of support behind you." One of the areas of growth that has been encouraged over the last few years are their banquet and special event facilities. Each year sees an increase in private weddings, corporate training sessions and private and public function held at the NRC. "We have so much to offer here but we definitely need to get the word out that we are here for everyone!" said Sherrill. "We have had a lot of success hosting training sessions for different companies because we are an all-in-one facility. A lot of times companies will hold a day long session in a place where their employees have to leave during the lunch break to find a meal and they discover that not all their employees return for the afternoon sessions. That is not an issue here as we can serve a hot, hearty lunch right on site, so the companies that have used our services experience a much higher employee retention and success rate for their sessions." With a main banquet room that can hold up to 240 people the Leduc Regional Chamber of Commerce regularly sells out their yearly luncheon that they hold at the NRC. Certain large companies in Nisku rebook their Christmas parties for the next year as soon as the current one is over, and with full service wedding packages that can include everything from the decor, food, indoor or outdoor photo settings, full bar and more the word is slowly starting to spread about this little gem tucked away in Nisku. The NRC is located at 606-18 Avenue in Nisku.